This 24.25 hour review and update in the areas of clinical chemistry, immunology, microbiology, and molecular medicine is intended to improve knowledge about the pathogenesis and clinical manifestations of a wide variety of metabolic, infectious, immunologic, and genetic disorders along with the selection, performance, and interpretation of clinical laboratory tests. All cases are archived. �To view them sorted by number, diagnosis or category, visit our Home Page and click on the Case of the Week button on the left. Thanks to Dr. Jamie Shutter, University of South Florida, Tampa, Florida (USA), for contributing this case. To contribute a Case of the Week, follow the guidelines on our Case of the Week page. 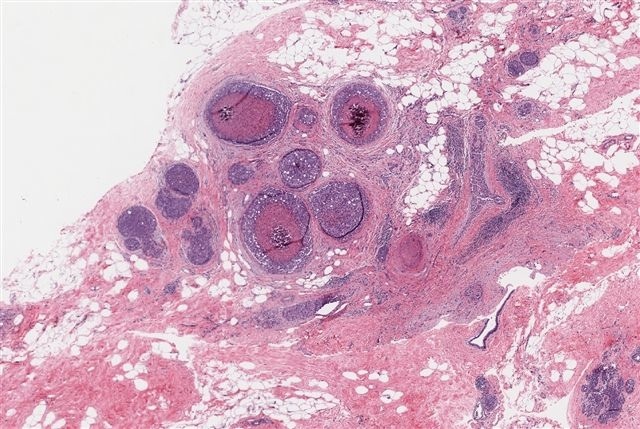 A 67 year old woman had a mammogram which showed calcifications in the upper outer quadrant.� A biopsy was taken. 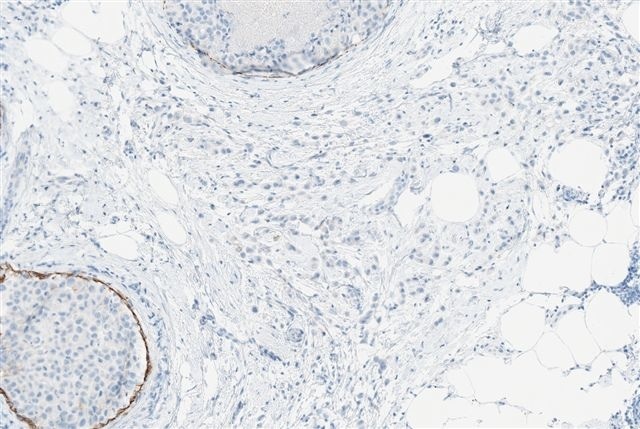 This case is presented because of the prominent pleomorphic lobular carcinoma in situ (PLCIS), which resembles high grade ductal carcinoma in situ (DCIS) due to the central necrosis, calcification and high grade cells. 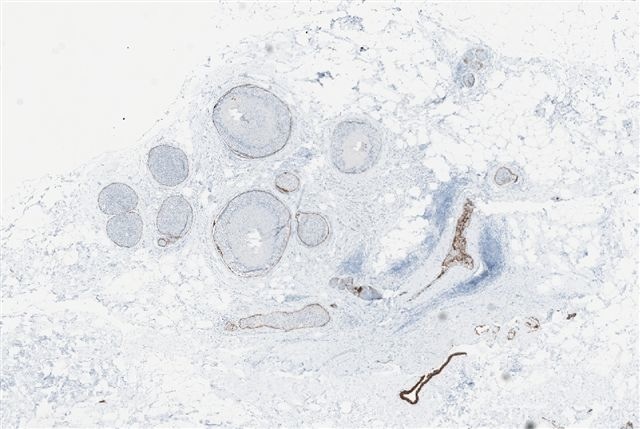 PLCIS has cytologic features that contrast with the uniformity of classic LCIS (Hum Pathol 1992;23:655).� The tumor cells are medium to large and dyscohesive, with eosinophilic, granular cytoplasm that may occasionally be vacuolated or appear apocrine (Pathol Oncol Res 2002;8:151).� The nuclei are eccentric and large (4x size of lymphocytes), exhibit moderate to marked pleomorphism and have distinct nucleoli.� Central necrosis is presented in 60% and microcalcifications in 40% of cases.� It is often associated with classic LCIS and invasive pleomorphic lobular carcinoma. 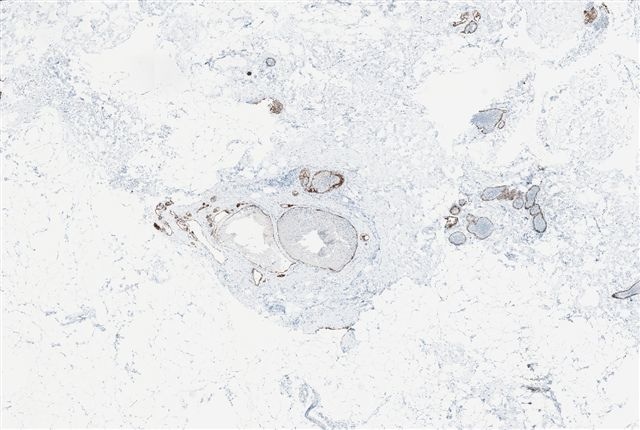 The tumor cells are usually immunoreactive for ER, GCDFP15.� They are negative for E-cadherin (Mod Path 2003;16:674), although E-cadherin staining is maintained in the membrane of epithelial cells in normal ducts, as noted in this case. 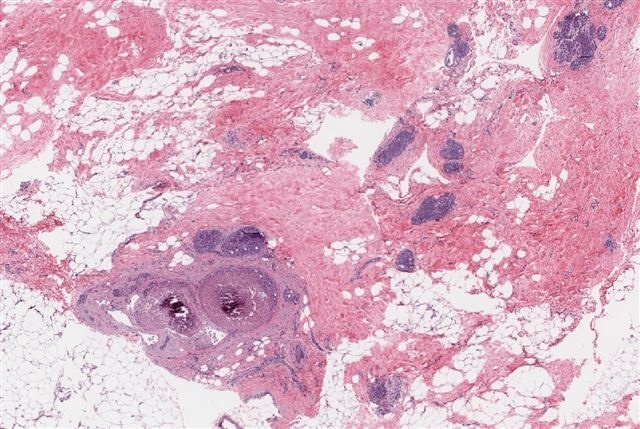 Pleomorphic LCIS has molecular features that are distinct from classic LCIS (Am J Surg Pathol 2009;33:1683), but it resembles invasive lobular carcinoma more than invasive ductal carcinoma (J Pathol 2008;215:231). 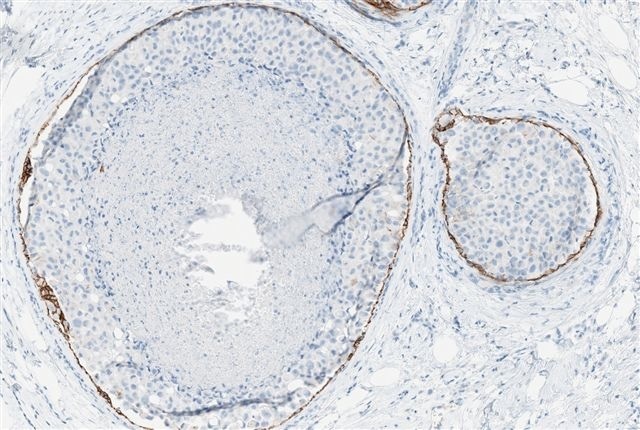 The differential diagnosis is primarily comedo-DCIS, which has cohesive cells and lacks lobular involvement.� It is typically strongly E-cadherin+, with complete membranous staining around tumor cells, similar to strong HER2 staining.� The tumor cells are also usually ER negative. 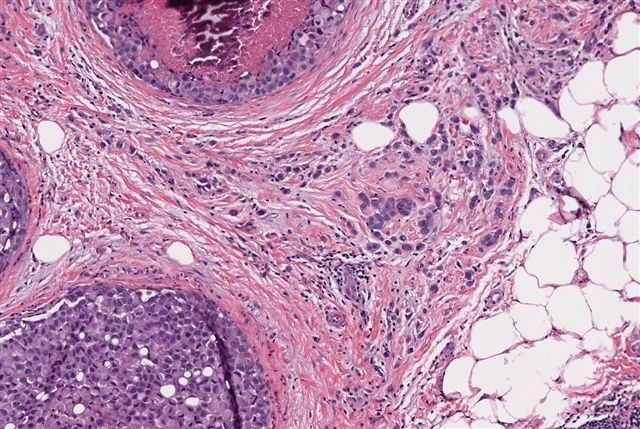 Treatment is similar to DCIS (excision with negative margins).� However, it is important to diagnose the pleomorphic variant of LCIS because these tumors are typically more aggressive than classic LCIS, and they are associated with invasive pleomorphic lobular carcinoma.